Check out the Caitlyn Jenner… she looks gorgeous. Clearly Caitlyn’s stylist is doing her miracles because she looks absolutely gorgeous!! 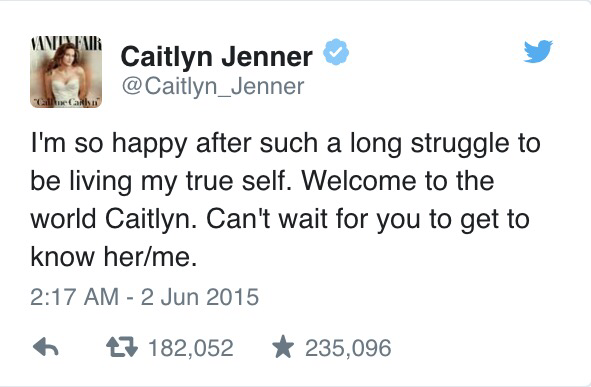 Goodbye Bruce Jenner, Hello Caitlyn Jenner! According to The source, Caitlyn specifically didn’t want her name to start with a K so he could be considered his own person. If his name had started with a K he would be identified with the Kardashians. Caitlyn took to her Twitter page and said how excited he was for the Vanity Fair Cover to come out so the world can get to know Caitlyn. We are so proud of you Caitlyn and we can’t wait to get to know you! Rob Kardashian has checked into the palm beach rehab clinic as of this morning. The sock king was confirmed into the centre this morning and according to his body guard Mark Behar, the 28-year-old former reality star has finally sought help for his battle with addiction. The star has checked into rehab for his addiction to alcohol, marijuana and cough syrup and will be seeking a 60 day treatment plan. We wish you all the best Rob! Stay strong!